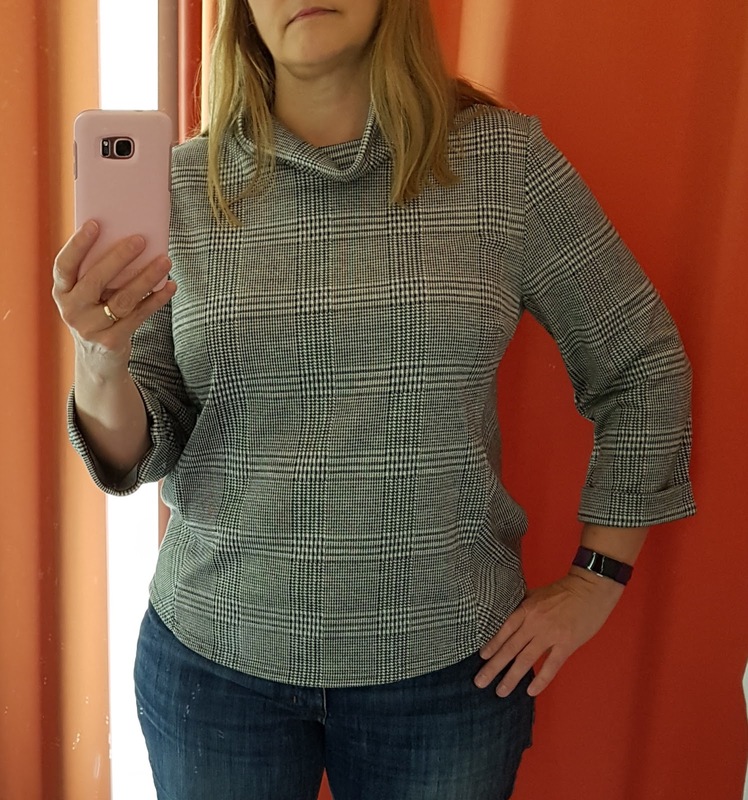 On a recent shopping trip I tried on a top that I liked but it was a little small and I didn't like the way the vertical stripe in the plaid wasn't exactly centered. I didn't find this top in a larger size and suspect that it would probably be too big in my shoulders anyway. But I can sew! I can make one to fit me, and if I make it in a plaid or stripe, I will make sure it lines up. I like the side panels, the 3/4 length sleeves, the curved hem, and the dart. I wasn't sure whether the collar was supposed to be folded over or unfolded and floppy like I'm wearing it. I saw a lot of these boxy little tops on the racks, so they seem to be very "in" right now. I think this one I tried on could be suitable for work when worn with black or gray pants. It's a polyester/rayon mix with a little lycra. The other tops I see are made in textured knits and seem more casual but not "sloppy", so they could be work suitable too. Perhaps the "sweatshirt chic" of a few years ago has evolved a bit. 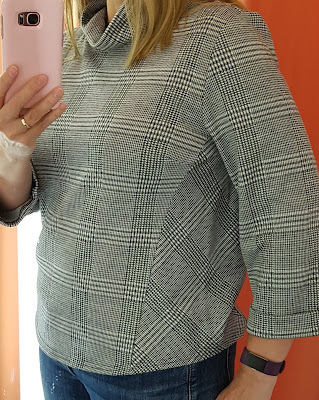 Note that the pink/gray top is from the August 2017 issue - Burda is often "spot-on" with the latest trends. So now I just have to make it, right? I think I might make the black one from the 9/2012 or the pink/gray one from the 8/2017 issue first - or maybe even instead of the knock-off. Oh and I found two patterns in Knipmode that would work, but would you believe that out of all the Knipmode magazines I have, which is nearly every month since 2015, the two tops are in the two issues I don't have, and they're not patterns that are available for download from their website. Go figure.